The four Grade 11 pupils, who run an ecogreen recycling project at Ribane Laka High School, will be launching a life skills centre for their community. Four Mamelodi teenagers’ recycling project recently afforded them an opportunity to experience the “unusual” pleasures of driving “miles and miles” for the best ice cream and living with a “homeless bipolar cat” that had an active Instagram account. The teens from the eastern township in Pretoria enthused about their experience in the US after being chosen to represent South Africa. Fortunate Mancoba, Precious Tladi, Bhekumuzi Phala and Given Ketelo had no clue that they would all make it into this year’s Pan-Africa Youth Leadership Programme for three weeks of leadership and project management skills training for 110 young leaders, aged 15 to 18, selected from across the continent. The four pupils, who lead an ecogreen recycling project at their school, Ribane Laka High School, used the initiative as a motivator to join the programme. Dressed in their navy-blue school uniforms at the US embassy’s Mae Jemison Centre at the University of Pretoria’s Mamelodi campus, they recalled how they received the news, using Tladi’s phone to check their e-mail. “We used her phone because she was the only one who had data. We found out that we had been selected while we were in class and we started shouting in excitement. Precious didn’t know at the time that she had also been selected. We went to the Mae Jemison Centre and asked who the fourth person was and they said it was her. 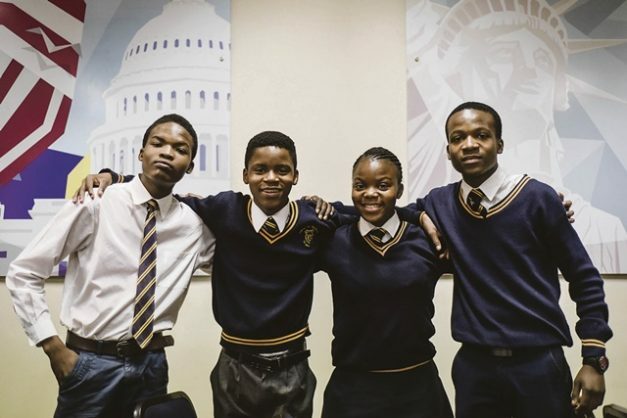 “In other countries, they selected randomly across the country but with us, it is a coincidence that the four of us are in the same school and the same class,” a delighted Phala said. From Germany, the pupils flew to Georgia, Atlanta. For three of them, it was their first overseas trip. In the beginning of their skills development programme, they were taught the history of Martin Luther King Jnr. “That was a wonderful experience. We learned how America became a free country for black people, and how Martin Luther King Jnr helped fight for the rights of black people,” said Mancoba. But the highlight of the trip was living with their host families, which were selected to match the personalities of the four individuals. The only girl in the group, Tladi, was hosted by a family that fights for women’s rights. “My family was protective of a girl child and her rights. I was taught about how girls live that side and we got to share our differences. Ketelo, a video-game lover, said he was fortunate to be housed by a family with children who were also gamers. Phala, however, loved his family who adopt stray cats. One of them is a homeless bipolar cat that wears a collar which releases fragrances to calm its nerves. The feline even had an Instagram account. After the training, these Grade 11 pupils will be launching a life skills centre for their community, an idea that a team of judges praised when the youngsters presented their community-based project during the programme.